After writing my opinion piece that was published yesterday (about what classical music should to engage the Internet generation), I thought I should eat a bit of my own medicine and upload lots of Magnatune videos to Youtube, especially the more behind-the-scenes stuff. you'll find live performances by Drop Trio, Emma Murphy, Jan Hanford and Artemis. You'll also find traditional music videos by The Bots, Octopants, Ammonite and Kokoon. 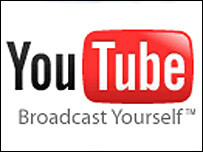 To make things easy, I'm embedding the Youtube videos on this page for most everything I uploaded today. 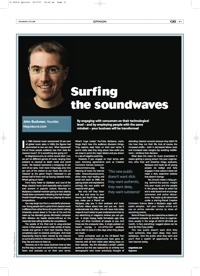 I was asked to write an opinion piece in Gig Magazine, and it was published today. Below is the text of the piece I wrote for them, along with a PDF version of it (click on the image to download the PDF). 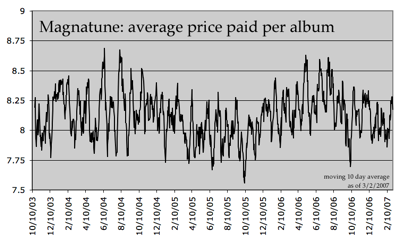 In 1980, Classical music represented 20% of global music sales. 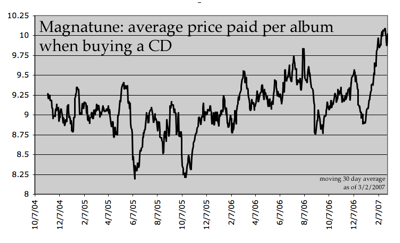 In 2000, Classical had plummeted to just 2% of global music sales. What happened? Did all those people suddenly lose their taste for classical music? Or is something else going on? At Magnatune.com, an online record label I run, we sell six different genres of music, ranging from Ambient to Classical to Death Metal and World Music. Yet Classical represents a whopping 42% of our sales. Even more intriguingly, only 9% of the visitors to our music site click on “classical” as the genre they’re interested in, yet almost half of them end up buying classical music. What’s going on here? From Harry Potter to The Gladiator and Lord of the Rings, Classical music (and especially Early Music) is ever present in popular culture. Recently on Myspace.com, a classical musician going on tour, playing Vivaldi, drew comments indicating the kids thought Vivaldi himself was going on tour, playing his recent compositions. You may laugh, but this is a wonderful phenomenon: young people don’t a priori think classical music is different from other forms of music, there’s nothing inherently uncool about it. The era of Djs and the mashup has blended genres. Minimalist composer Wim Mertens sits beside electro-chill-out on the massively-best-selling Buddha Bar compilations. The upside of the ipod and its song oriented nature is that people want a wide variety of styles, moods and genres in their mp3 libraries. They’re completely open to classical, world, jazz. And most importantly: they’ve been trained by the Internet to surf and to think for themselves in deciding what they like and want to listen to. However, we in the music business have to take the first step, to reach out and let this new audience listen and evaluate us on their own terms. What’s huge today? Mp3s, Youtube, myspace, blogs: that’s how this audience discovers things. They explore, read, listen on their own terms. If you’re not interesting, or represent an unappetizing ethic (i.e. The Industry Machine, the RIAA, DRM), they tune out. If you’re really bad, they blog about how awful you are (case in point: the major labels) and you drown in a sea of negative publicity. However, if you engage on their terms, with open licensing terms such as Creative Commons licenses (www.creativecommons.org), free listening of music via Internet radio (www.shoutcast.com), allow some mp3 trading, avoid evil (such as DRM, not paying artists and exploitative pricing), this new public will respond with gusto. Not only will they listen and buy and come to your shows, but they’ll blog about you, make you a friend on myspace, play you in their podcasts, and make youtube videos about how cool you are. Don’t underestimate the effect this will have: kids today respond much better to peer endorsements than to any advertising or magazine reviews you can garner. A single sloppy, badly formatted, ugly blog entry will drive hundreds of people to you. And those are the unpopular sites. A single podcast on “Dave’s Lounge”, a run-of-the-mill podcast, caused 300 CD sales in a few days when they played our music. Some orchestras such as the UK-Based Fiori Musical http://www.fiori-musicali.com/ have gone all Internet, with all their ticket sales taking place on their web site. Yes, this alienated a certain luddite audience, but this was replaced by an entirely new audience who never previously explored attending classical concerts because they didn’t fit into how they run their life. And of course, the increased profits, both in decreased labor costs and increased sales margins (by avoiding middlemen) further reinforce their decision. What does this mean for music ensembles? It means getting a young person into your organization, who lives and breathes blogs, youtube, podcasts, myspace and mp3s (as all young people do today) and fully engage in that culture. It does not mean a slick expensive web site that doesn’t change. You should create a blog giving behind-the-scenes insight into your music and the people in the group. Make an email list, and a web-board, and encourage comments and active discussions. Put mp3s up for download under a sharing-friend Creative Commons license. Make a myspace page with audio samples. Sell your tickets online, and use an online calendar service to show all upcoming events. None of these things are expensive, as dozens of companies compete to provide them to organizations, usually on the £10/month range. In fact, everything I suggest above can be done for free I you prefer. This new public doesn’t want slick: they want authentic, they want deep, they want substance. Give the public what they want, and you’ll find a wealth of opportunity in the new Internet reality. Do you know how get clean drinking water in disaster conditions? Well, you will now, thanks to The OpenWater Project, a cool little video that came out of an Instructional Technology class taught by Professor David Wiley at Utah State University. Wiley's students decided to use about 75 percent CC licensed images and video, then shot the rest of the footage themselves. For their soundtrack, they used music by Justin Bianco, Wicked Allstars, and AntiGuru. Aside from showing a bunch of different methods for getting potable water in disaster conditions, the project also aimed to show how important and useful it is to have open content available to non-profit organzations. Next week David Wiley will be presenting the OpenWater project to international educational leaders including a former deputy secretary of education. He plans to show CC content can help government and disaster relief organizations to bolster awareness and lower production costs. 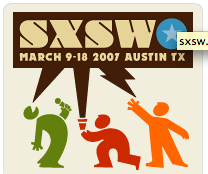 We just got back from 10 days at the Sxsw interactive, film and music festival in Austin Texas. Magnatune was an exhibitor during all 3 parts of the show, and I spoke on two panels as well. Sxsw/film is the best trade show Magnatune exihibits at, because it's all indie film-makers, making amazing films and looking for alternatives to the traditional evil major labels, who aren't all interested in indie films. Usually, we license enough in the 2 weeks after the show to more than pay the expense of it, which is why this year we came out in force, with all 5 of us at the show. The first panel I went to was Lonelygirl15, and I was truly blown away by all the innovation going on with this project. They're successfully blurring the line between audience/actor but also between staged/real. 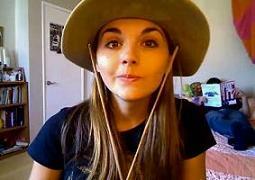 For example, when the characters form Lonelygirl15 went on a live chat, in character, one of the fans on the chat said that if Bre ever needed a place to stay, she could stay at their place. Bre then did a show on this, asking the audience if this was weird or not. The audience thought it might be ok, so in a future show, Bre runs away from home and escapes to this person's house. It turns out the fan was actually a plant, put in to see if the fans were into this storyline, and effectively making fans feel like they themselves might be part of the story. Very, very clever. Lonelygirl15 has used a lot of Magnatune music and always credits us, as well as tagging their Youtube videos with Magnatune when they do so. After their talk, I went up to talk to the business guy, and heard someone asking him "what do you do for music?" 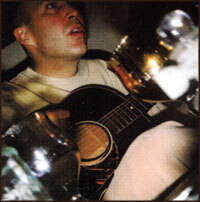 to which he replied with how great Magnatune was and how you can listen and then license online. Bear in mind, he had no idea I was listening in or who I was. The person was quite unhappy to hear about Magnatune because they were a music supervisor who was trying to sell their services to Lonelygirl15! I chatted with the biz guy a bit and he was extremely friendly and very, very positive about Magnatune. We ran a panel on low-cost music licensing. In the past, ASCAP has run the only music licensing panel at Sxsw, and it's always a disaster (IMHO) because they invite big film-makers and other big-shots up there, and their advice is always "what's the problem? You just hire a lawyer and a music supervisor and they take care of it". That's hardly useful for people filming a whole film on a $10,000 budget. We've been pitching the Sxsw folks on a "low budget music licensing" panel, which they gave to us this year. It was well attended, though pretty heavily technical. I was also on a panel run by Creative Commons. The energy level was a bit low, so I picked a fight with the lawyer from Youtube. The lawyer is actually Glenn Brown, former head of Creative Commons, and we've been friendly for years, so this was hardly a nasty fight. But, point was the Youtube is the "wonderful thing that's gone terribly wrong" in that every media owner is angry with them and spewing DMCA take-down notices at them, and it's not clear at all to me that Youtube will survive the collected venom of the video industry, and Youtube looks a lot like Napster to me (from a legal standpoint). Glenn countered that there was only one lawsuit currently, so there was hardly a stampede of lawsuits. Ironically enough, the next day Viacom launched their billion dollar lawsuit against YouTube. Another blog which mentions this panel. All five of us went to hear Magnatune artist Arthur Yoria play at an Austin club as part of Sxsw, and my favorite jazz band (and Magnatune artist) Drop Trio also played during Sxsw. Magnatune artist Myles Cochran is interviewed today in a podcast titled Lending a Voice. 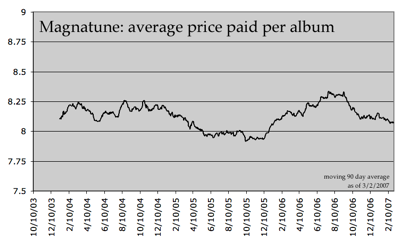 Below is a chart of the number of music licenses Magnatune sells each month. You can see that for the first 3 years of Magnatune, we sold about 10 to 20 licenses per month. In 2006, our licensing business started to really take off, and we're seeing about 60 licenses per month (an average of 3 licenses every business day) and the numbers keep climbing. Most recently, we've started getting price quote requests from Hollywood, which is interesting because we tried to crack into that business for two years in 2004-2005, by paying for a lead service, sending out CDs in responses to requests for music and following up, and never got even a call back. Now, they're faxing us, asking for a price quote for a song they've already picked for their scene, and for pre-approval for use of that song, signed on the fax. This, apparently, is how Hollywood works: they call you when they're interested in your song, and you say "it's ok" and at what price, so they can then decide whether to go with you or someone else. I'm quite pleased that we're starting to break into that market, it shows that it's not impenetrable and Internet music licensing may have a future in traditional media. 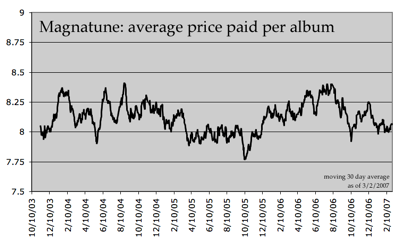 Here is an updated chart of the average price per to purchase an album at Magnatune, showing 3 1/2 years of data. The average price fluctuates a lot, so I'm presenting two charts, so you can see the general trend, and the variation.